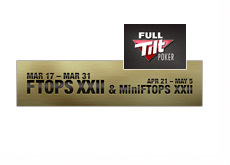 Full Tilt Poker released the schedules for FTOPS XXII and MiniFTOPS XXII earlier this week. FTOPS XXII, which will be the second FTOPS held since Pokerstars purchased Full Tilt Poker last year, will run from March 17th to March 31st. MiniFTOPS XXII, on the other hand, will run from April 21st until May 5th. A total of 38 events will comprise FTOPS XXII. According to Full Tilt Poker, "three new and exclusive tournament types will be introduced at Full Tilt Poker over the coming weeks, and all three will feature in FTOPS XXII." These three events will be added to the schedule at a later date. The first event that is currently on the schedule is Event #2, which will be a $200 + $16 No Limit Hold'em tournament with re-entries. The guarantee for this event is $850,000. The last event on the schedule is the $600 + $40 No Limit Hold'em (w/ re-entries) main event, which will be get underway on Sunday, March 31st at 13:30 ET. This event will have a guarantee of $2 million. FTOPS XXII will have a total guaranteed prize pool of $10 million.